Through this blog we share farm news with our customers: What's ripe, orchard operations throughout the year, an appreciation of nature's beauty, and delicious fruit-centric recipes! This is our 42nd year in operation. Cooler weather and shorter days are here. It's Fall again, the time when walnuts that have been maturing all summer are falling from their husks. 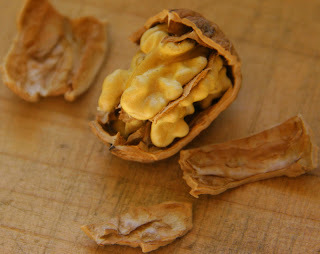 Walnuts are nutritious, tasty and versatile and we eat the majority of our small crop ourselves throughout the year. Here we will share some tools of the trade that speed up both harvesting and shelling this locally abundant food. For easiest harvesting we wait until most husks are at least split open. 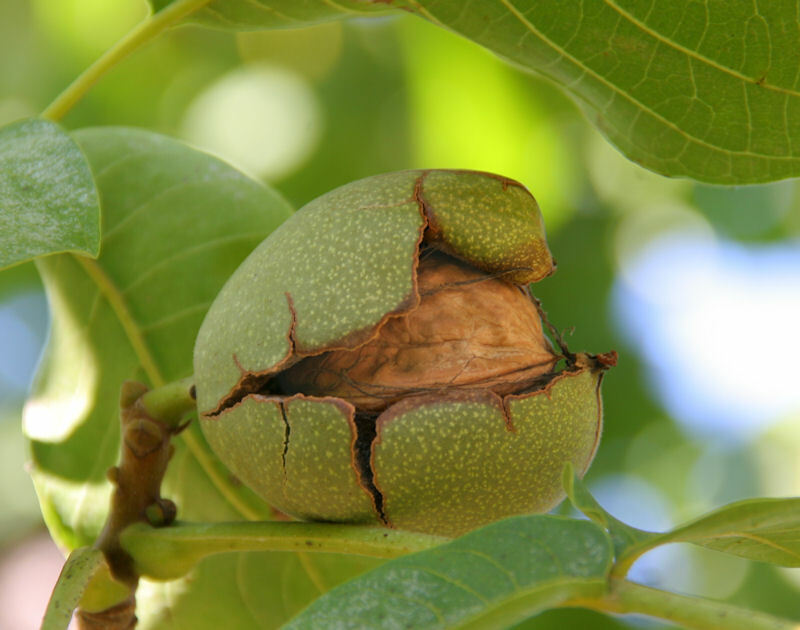 Then knocking the branches with padded poles or shaking the branches will easily release a shower of nuts onto the ground. Next is picking them up. That used to mean sore back time - bending over or crawling on hands and knees to fill buckets. But not any more! 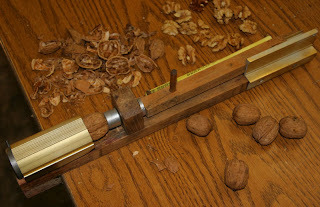 Since a friend told us about the Nut Wizard this once tedious job has become a breeze. This tool might at first look like just another gimmick, but in fact is a well made and very effective tool. 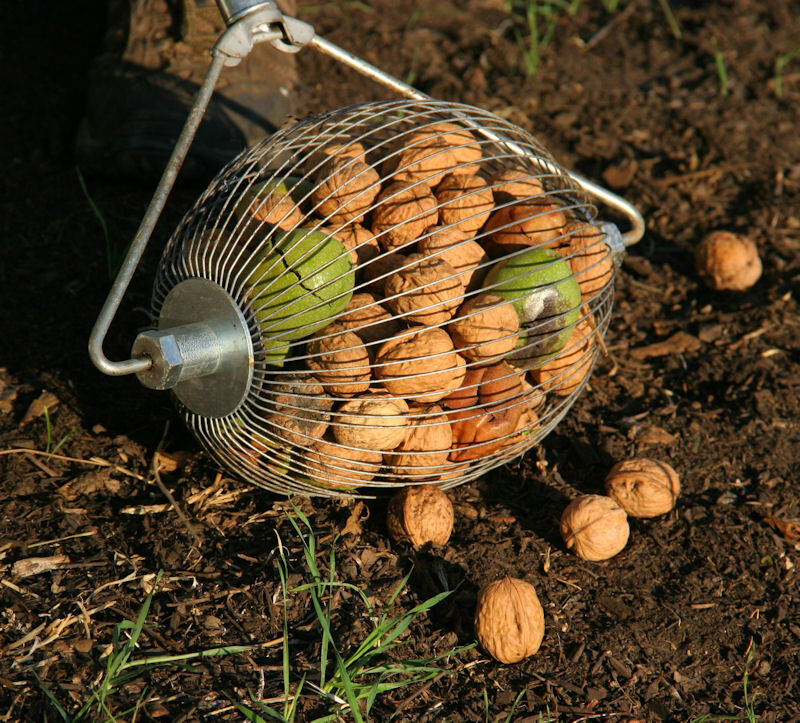 Simply by rolling it over the ground it will pick up any type of nut, small to medium citrus, apples, golf balls and more. Roll it over walnuts and as if by magic they instantly pop inside the flexible wires of the rolling basket. 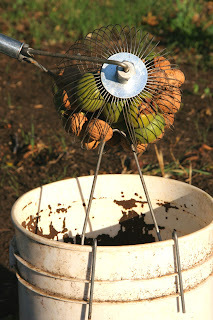 Then when full just lower it onto the included bucket hoop; this spreads the wires and the nuts fall into the bucket. It's so much fun to use you may be tempted to dump the bucket out and pick the nuts up again! 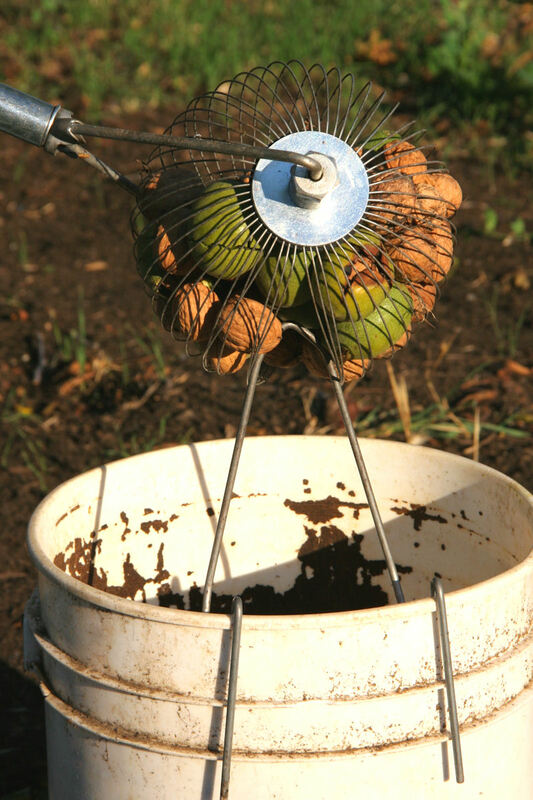 After harvesting, the nuts need to dry thoroughly before shelling. We spread them out on racks or in shallow boxes in a warm dry space for several days, until the meats become dry and brittle. The Texas Inertia Nut Cracker - This is a great little device, easy to use and it yields mostly halves. Just place a nut in the cracking chamber, pull back on the rubber band powered plunger and release. The shell is shattered without damaging the nut meat. Although it cracks one at a time, the job goes fairly fast once you get a rhythm going. Works with most types of nuts. The Davebilt Nut Cracker - This is a heavy duty hand cranked machine that cracks nuts continuously. Just load them into the hopper and crank away. 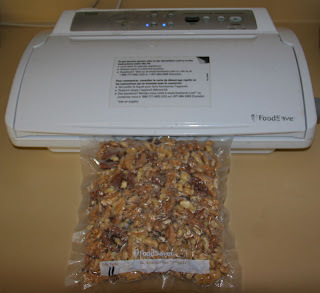 It is easily adjustable for English walnuts, pecans and almonds. This is the one we use, though I've modified ours to run off of an electric motor. But even hand cranking it works much faster than a single nut device. It yields a good percentage of halves and some smaller pieces of nut meat. Definitely the way to go for anyone with a whole tree's worth of nuts. Once shelled, the oils in nut meats quickly go stale. 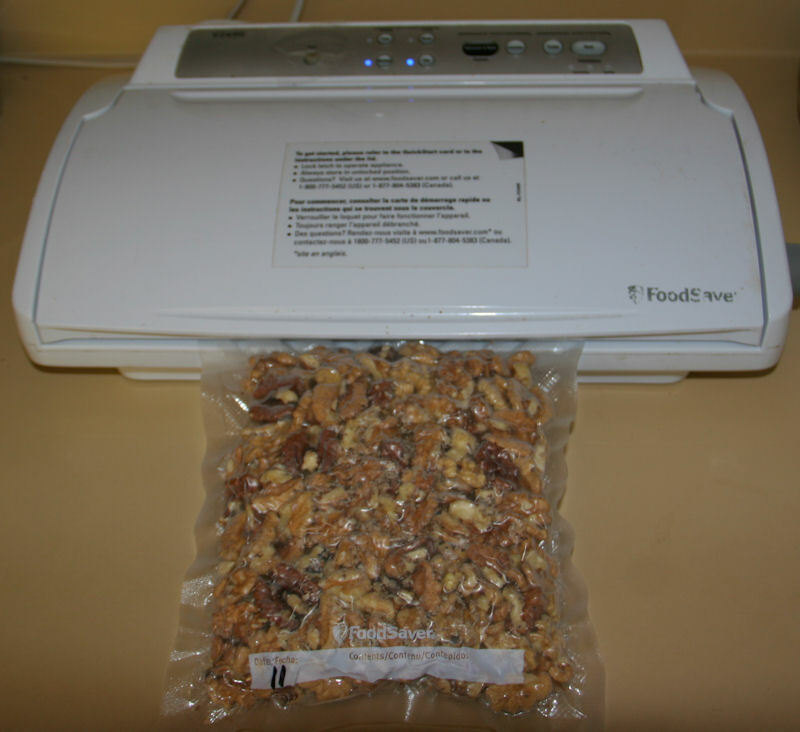 So as with much of the food we preserve we use our trusty Foodsaver to vacuum pack the nuts into compact book-shaped bags then store them in our freezer. This is our version of an Epicurious recipe called Everyday Granola; for comparison purposes, you can check out the original recipe at this link. You might want to adapt the ingredients to your taste preferences as we did. Mix the wet ingredients together and warm gently on the stove or in a microwave so you can stir and blend them together. Drizzle the wet mix onto the dry ingredients and stir with a large spoon to coat the oat mixture evenly. Put the mixture in a large rimmed baking sheet, spreading it out evenly. Bake in a 275 degree oven for about 30 minutes, stirring the mixture every 10 minutes or so to assure that it browns evenly. It should look golden brown when done and the nuts should taste pleasantly crunchy. Serve for breakfast with yogurt, fresh or dried fruits, and/or milk. 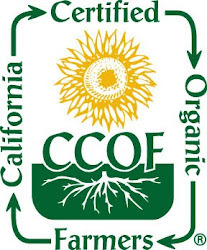 Certified Organic growers of apricots, peaches, plums, figs, citrus and persimmons on our 4 acre "micro-farm"